Feedback's Classic Work Stand features an anodized aluminum construction and slide-lock clamp for easy bike maintenance at home. 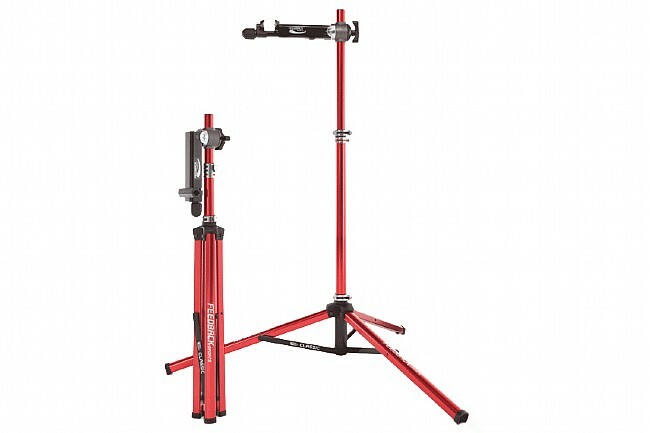 Weighing it at only 11.1 lbs, the Classic Work Stand is easy to fold out, and once the 54” diameter base is extended, the clamp height can be adjusted between 42” to 71” for perfect bike placement. The no-fuss slide-lock jaws are what have set Feedback's work stands apart from the very beginning, and they rotate a full 360° for easy access into a bike's hard to reach areas. Load capacity is 85 lbs. Folded size is 5” x 6.5” x 45”.